So with December, my birthday and Christmas came and went. Luckily I managed to get some cash as gifts, so I went a little crazy purchasing things for myself, it felt like forever haha. Anyway, one of my splurges was on Walmart's website, where I picked up a few things. 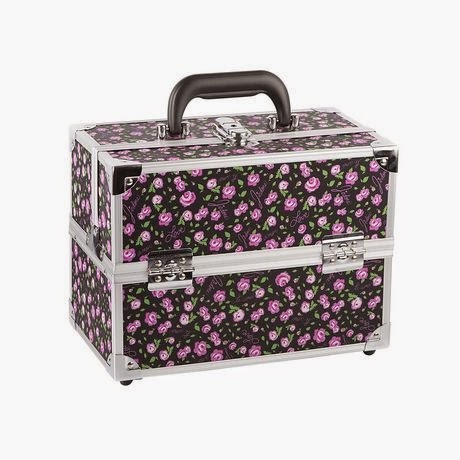 One of the things I ordered was a makeup train case. I don't have one, I've never had one, and I thought it would help me by keeping everything in one place, and better organized. The only downside I would say about this case, is that it wasn't as deep as I thought it was going to be. I guess that's my own fault because I bought it online without seeing it in person. But, it is good enough. Not all of my makeup fits into it though, BUT that just means I need to use up some older products. I went through everything, discarded some, and put some aside to use up. Hopefully I can get some empty products! 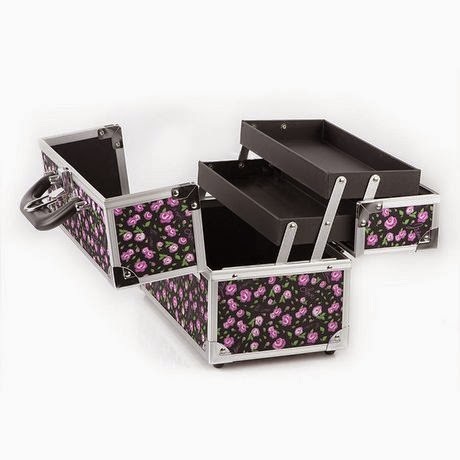 Another thing that annoyed me, was that I ordered (or what I thought I was ordering - as the above pictures were shown) was a black case with roses on it. I ended up getting this black and purple case instead. It's not ugly or anything. I just was super confused when I took it out of the box, and that was the print instead. I decided not to follow up with Walmart because I figured they would just say they ran out of the print that was shown and that's what they sent out instead. Plus, it was on clearance, and it's no longer available anymore. So, I'm happy I even got one. I ordered this Vitamin E Skin Oil because I've been having some issues with dry flaky skin. I had used Vitamin E Ointment which helped clear it up, but it was close to being finished and I didn't want to risk the patches coming back. I will do a more detailed review on this soon. 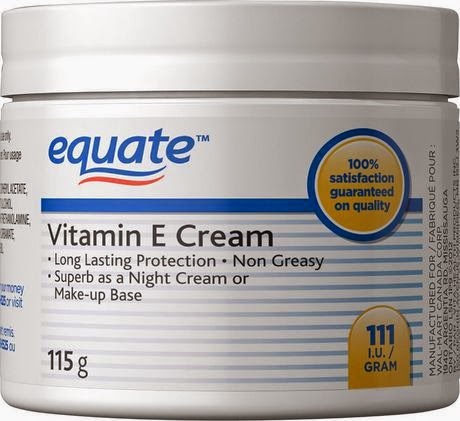 I also ordered this Vitamin E Cream. I've seen reviews online saying how great vitamin E cream has been for their dry skin, so I decided I would also give it a try. I was enjoying the Mario Badescu night cream I previously ordered, but the scent is so strong. Every time I put it on, my boyfriend likes to tell me I smell like an old lady. So I will keep the MB, and wear it over top of the Vitamin E oil, or cream as an added moisture bonus. Until it runs out at least. I'll do a detailed review of this with the Vitamin E oil. I almost always used to apply my foundation with my fingers, until I found a makeup sponge recently. 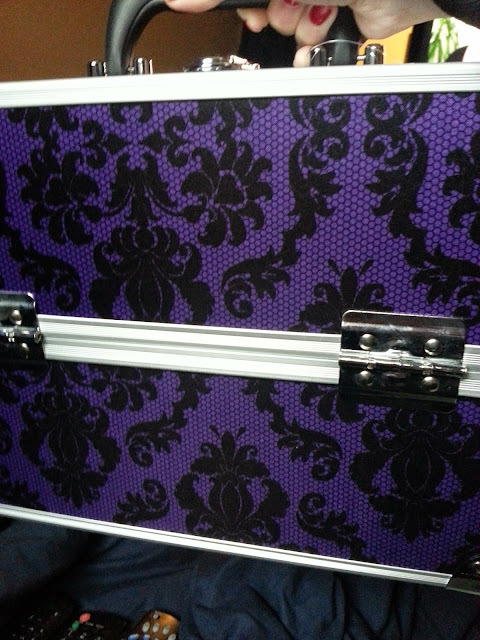 It must have been hidden with all my other makeup stuff. I decided to give it a try again, and I liked the way it applied the foundation to my skin. Since I only had one little sponge, I decided to order this pack of 30. Well, I have to say I'm not really impressed. This sponge is a lot more dense than the previous one I found (from E.L.F) but I will have to make due, since I have so many now... haha. These quilted pads are great for removing makeup, or using toner. I even use them to remove nail polish. 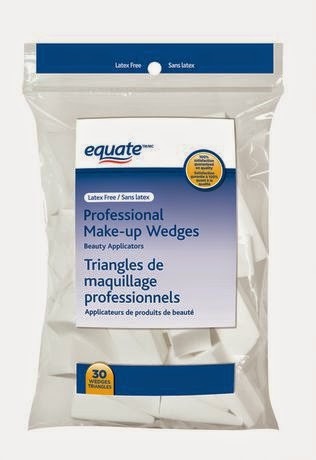 I find them so handy, and have used their equate brand before. I picked these up because I'm almost done with my previous pack. These are always good to have on hand. Lastly, I ordered these makeup remover towelettes. They say they remove make-up including waterproof mascara. It has aloe, cucumber and green tea. These never actually showed up with my order, so I assume they were back ordered. They seem to be available again on the site, and I emailed Walmart just last night to ask when I should expect these. I can't comment on how well they work since I have yet to receive them, so I will do a detailed review once I get them. 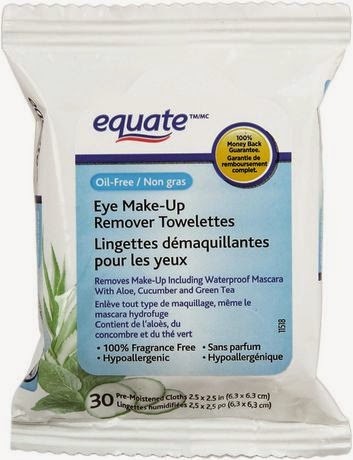 Have you tried these Equate makeup remover wipes? What did you think of them! ?